I'm a huge Jennifer Weiner fan and I've said that I've read all her books....and I thought I had. Then, I was going through a pile of books on my TBR table (where the overflow that won't fit on my TBR bookshelf lives) and I found this one. I apparently purchased this, probably back when it was released, and then it was buried. Oops! 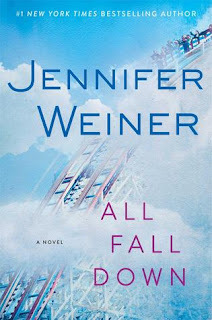 On the upside, it has been a while since Weiner's last adult novel, so this was kind of like a brand new release to me. This book is not Weiner's usual fare. She deals with addiction, which she had only peripherally touched on in other books. The drug of choice in this book are opiods, which was fascinating. You see, I'm one of those people who have never done drugs, but I've heard and read enough to have kind of an idea of what it might feel like. I have had a bit too much alcohol from time to time, so I do know what that is like. But I've never understood painkiller addictions. It's not that I don't believe it is a real thing--but I've had things such as Vicodin and Oxycontin after surgeries and....they have done absolutely nothing for me. So, I just couldn't understand what the appeal was (and I wasn't about to start popping pills to find out). 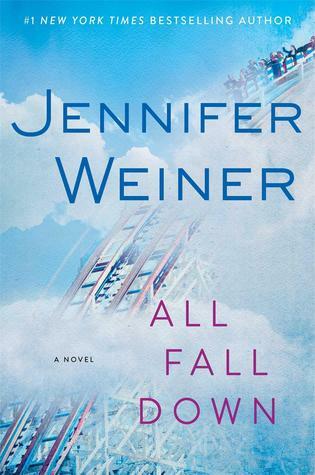 Here, Weiner spins such a compelling tale that I could almost feel the highs and lows as Allison goes through them. I also could understand why Allison would turn to pills when the rest of her life was so out of control. Once I picked this book up, I couldn't put it down (and, since I read most of it on an airplane, that was not an issue!). Weiner's story telling is in top form here. The pacing is perfect to reflect the frenetic life that Allison lives and in speeds up as she begins to spiral. Allison is a character that I'm sure many readers can relate to. While I don't agree with her choices (and I'd like to believe I'd never make them if I were in her shoes), she is still utterly believable. I did have a few nit-picky things--I wish Weiner had fleshed out Allison's husband a bit more. We barely get to know him and I think that if there was more to him, it would only enhance our understanding of Allison. I also felt the last section was a bit bogged down and about twice as long as it could have been. Still, this was a very satisfying read and I would put it towards the top of Weiner's books. I would recommend this book to just about anyone.